I had thought I’d write a whole lot of blog posts while I was in Melbourne. I thought I’d be so excited about what I was doing that I’d want to share it. And I was excited. But I worked out pretty quickly that I wouldn’t be able to share it for some time, even if I wanted to. More and more lately, I find I need to let things settle before I can approach them again in writing. This is true in my personal life as well as the stuff I write that I call ‘work’ (the line between the two is often very difficult to distinguish). It’s nearly two weeks since I came back to Sydney, but I still don’t really feel like things have settled. A number of things have shifted, in subtle but important ways. I’ve tried to find an appropriate analogy for what’s going on in my head, but they all sound far too dramatic, when the action that’s caused the shift wasn’t really anything special. The first yoga class I taught when I got back to Sydney was strange. It was one of my corporate yoga classes. At lunchtime I found myself in a very familiar office building, sitting on my mat in a very familiar empty wing of the fourth floor, chatting to regular students. Then the little travel alarm clock I use to keep time in yoga classes ticked over to midday, and I suddenly realised that I was the one who had to teach the class. For some reason, it came as a surprise. And then when I did start teaching, I found myself making changes to my usual way of sequencing poses, and the words that came out of my mouth focussed on different things: the spine instead of the arms, the feet instead of the legs. I found myself walking around more, watching, really watching my students. Most of my classes are made up of regulars, but that first week back it was as if I was looking at a whole lot of new people — not because of any real change in the way they moved, but because I was looking at them differently. The strangest part of all of this was that it all happened without me even thinking about it. Usually when I make these changes to the way I teach (or the way I do anything, really), it’s a conscious decision, but this wasn’t conscious at all. It just happened. I don’t know yet whether they’re good changes or bad changes or changes that make no difference at all, and I don’t know whether the fact that they’re unconscious is good or bad or has no meaning at all. I’m sincerely hoping that things do settle (at least a little) sooner rather than later. I think they will. I’m working on a number of exciting projects at the moment — some writing, some yoga — and they seemed to have at least calmed the frustration to below tantrum-causing levels. It’s a better mental place to be. So I might eventually get to sharing some of the half-complete drafts of posts I wrote about the MWF sessions I went to in Melbourne. I hope I do; we saw some pretty great stuff. But I might not either. And, actually, as frustrating as it has been, not really knowing how things will turn out, even with whether or not I press ‘publish’ on a blog post, is also kind of exciting. I’ve been writing this post for weeks, on an off. It seems appropriate to finish it now — a death in the family always lends itself to remembering and nostalgia. For a couple of months now I’ve been carrying around a little vial of nostalgia, everywhere I go. Sometimes I really do feel as though it’s rattling around in the bottom of my handbag, and when I go searching for something else I come across it. The thing about nostalgia (at least for me) is that it’s so unspecific. I can’t really say where it’s come from, or even what it’s about. Or maybe it’s that I can say where it started, but then I’m unable to contain it to that. Nostalgia breeds nostalgia. Sometime last week I found myself sitting on the couch, home by myself for the night, with a huge pile of recipe books, flicking through pages, making mental lists of things I’d like to cook next time I find half a day to spend in the kitchen. As I turned the pages I came across recipes I’d marked months ago, and finally worked out the root of this bout of nostalgia: I love my new house, but I’m also missing my old one. I miss my old housemates, I miss the house itself, I miss Astro the cat, I miss living down the south end of Newtown. I’m not despairing in the missing, it’s just a lingering sense of… sadness at the finality, I guess. We cooked a lot in my old house. I cooked a lot. It wasn’t a great kitchen — it had a huge oven, but we also spent the last six months in the house cooking by lamp light — but it’s where I really feel like I cemented my love of cooking. I spent hours and hours cooking in that kitchen, sometimes many dishes at once, often on my own. Cooking became a kind of meditation; thoughts about other things popped into my head during big cook ups, but the focus always came back to whatever was on the stove top. I also spent many hours in that kitchen, sitting on the step between the lounge and the kitchen or perched gingerly on the barely-held-together stool we’d borrowed for a party and somehow never returned, chatting to one of my housemates about life — work, boys, politics, religion, music, books, writing, cats, dogs, babies, family. We cooked, we talked. The kitchen in that house will always be somehow special to me. Thinking about that kitchen inevitably leads to thinking about the garden at that house, my little room and the neighbours whose backyards my windows overlooked, the creaky floorboards in the upstairs hallway, the sunny lounge room, the cracked walls, the ballroom-sized bathroom… the list goes on and on. And then spills over into other parts of my life, occasionally going as far back as childhood. That my trip to Melbourne happened in the middle of all this nostalgia really hasn’t helped things. 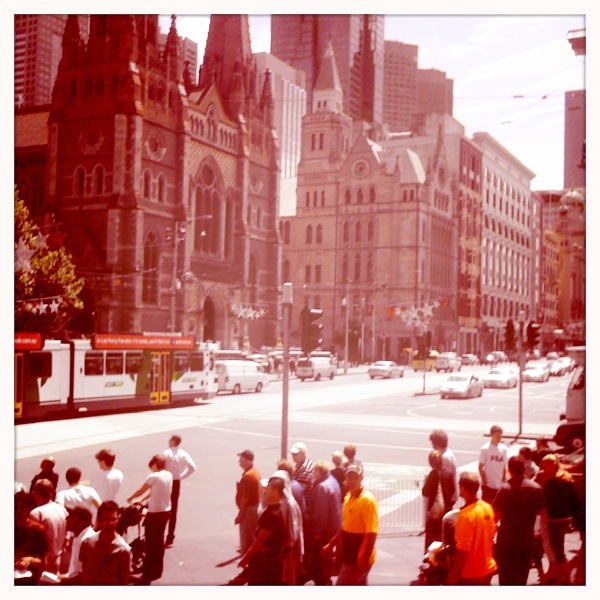 I miss Melbourne with such a visceral ferocity that it’s sometimes overwhelming. Going back there, I wander around the streets, amazed that I still feel so at home there, even though I’ve now lived in Sydney nearly as long as I lived in Melbourne. Strangely, I also feel nostalgic about writing (this is far harder for me to explain). Spending time at writers’ festivals, like I have this last month — especially ones like EWF where I spent a lot of time in the company of other writers — exacerbates this kind of nostalgia. I think maybe what I’m trying to do when I write (fiction, at least) is capture that feeling of nostalgia, that little twinge of melancholy. So somehow thinking about or talking about writing brings about those feelings I’m trying to capture. Does that even make sense? I don’t know. Perhaps this nostalgia, and its settling in for a lengthy stay, is why I’ve found myself wanting to write more fiction. For the last six months I’ve been working steadily on a big non-fiction project. I love it, and I don’t want to put it away, but I think maybe I need to let myself venture a little more into whimsy from time to time. Yogic philosophy would tell me that everything is impermanent, and that holding onto it like this is just going to make eventually letting it go more painful. So here I go, whisking the band-aid off. I’ll try to express some of the major points I took from the conversations and sessions I found myself in. On Friday, Saturday and Sunday nights I found myself at bars and restaurants, talking through the problems of the world (literary and otherwise) with various emerging writers. I think we solved a few of them, at least in theory. On Sunday evening I also found myself sitting on a futon with my three hosts (A, G and S) flicking through art history and mythology books, wishing I had enough time in my life and space in my head to pursue these minor interests of mine with more gusto. On Saturday and Sunday I went into the city for the Town Hall Writers’ Conference. When I bought my weekend pass for this I really wasn’t sure what I’d attend. I found myself in sessions about writing and health, blogging, typecasting and different voices. I wish now that I’d gone along to a few other things as well, but I’m actually not sure that I would have been able to contain all the thoughts safely inside my head. I’ll try to give you a snapshot of each session. Writing and health: If you’re a writer with health problems, chances are it will have an impact on your writing — sometimes good, sometimes bad. Sam Twyford-Moore, whose brilliant essay on writing and mental health can be found here, made an excellent point about the treatment for health problems (mental or physical) having a negative impact on your writing: if you don’t seek treatment, especially for serious health problems, your death is going to have a very negative impact on your writing indeed — to risk avoiding treatment because it might dampen our ability to write is not really worth it. Blogging: This ‘in conversation’ was fun, because it was run by a blogger who blogs only for fun, and a blogger who also blogs for money. They both agreed that blogs need to have a personal voice, or they’ll not find readers, but didn’t necessarily agree on whether bloggers should be paid. Philip Thiel blogs because writing about himself forces him to actually do interesting things, and feels like the experiences he has as a result are payment enough; Jessica Au used to contribute to Meanjin’s blog, Spike, and thinks bloggers who write for organisations should be paid, and that perhaps it is the origin of blogs as (sometimes very personal) online journals that means this financial arrangement between organisations and their bloggers hasn’t quite been worked out. Typecasting: I feel like I’m not going to do this session justice, despite having taken pages of notes during it. (Just in case I don’t, Angela Meyer and panellist Ryan Paine have both blogged about this session.) The panel included Anita Heiss (the ‘indigenous writer’), Julian Leyre (the ‘gay writer’), Ryan Paine (the ‘young writer’) and Karen Pickering (the ‘feminist writer’), and was chaired by Dan Ducrou (a ‘young adult fiction writer’). Each panellist discussed the benefits and pitfalls of stereotypes. Anita said that “being in a category called ‘chicklit’ somehow devalues your work. It says that your stories don’t have value… if the work of a chicklit writer is devalued, then so too are the lives of the women I write about.” Julian spoke about the freedom he has in the ‘queer writing’, because that category hasn’t been properly defined, so he’s able to bring into his writing other things he’s interested in, like cross-cultural issues and racism. Ryan addressed the problematic idea that young writers are less qualified to write about the world because of their inexperience (in life and writing), and said that he’s found that maybe the opposite is true, because young writers are far more likely to consider new ideas, perhaps because of their inexperience. He warned though, that even young writers need to be vigilant in questioning commonly-held beliefs, saying, “By pedalling the same opinions to one another because we’re too timid to question our friends we are actually inhibiting the very progress of human thought we claim to advocate.” Karen sees writing mainly as an idea delivery system, but hopes “to reach out beyond [her] natural allies and engage”. The ideas from this panel in particular are hanging around in my head. I’ve always found it really grating to be typecast as anything, but I can see there are advantages to finding a particular niche. With all the changes I’ve made in my life in the last year or so, I sometimes think that being typecast might actually help me work something things out about myself. I’d just like to be able to shed that stereotype when it was no longer useful to me — and perhaps that’s exactly where the problem lies: shedding the stereotype is really difficult to do. Different voices: I think perhaps I’ve written here before about the people that live in my head. I have fiction characters sitting in there, and occasionally they pop into my thoughts as if they’re real people. Sometimes I wonder whether I have the right to write from the perspective of an elderly man with dementia, or a young boy whose brother has drowned, so I was interested to know what other writers thought. Perhaps I will elaborate on my thoughts from this panel at some point over the next few weeks (I have pages and pages of notes), but for now I’ll leave you with the summary agreed on in the question time: to write from the perspective of someone who is not like you, you need a healthy curiosity (which might mean lots of research) and a genuine feeling of empathy for that character — only then will you write with a voice that sounds authentic and avoids condescension. I also want to write a little about the TwitterFEST discussion I hosted on Tuesday (when I was, sadly, back in Sydney), but this post is already far too long. I’ll try to get to writing about that discussion later this week. Now excuse me while I go off to nurse myself through my post-festival blues.